So, This is the 4th Day of me doing this 20 Days Makeup Challenge on Insta Gram. Its "Sunset Inspired". I was not sure as what to do. I searched and found girls usually do sunset inspired eye makeup which is too main stream so i decided to try Sunset Inspired Lips. This sunset inspired look signifies evil n darkness after the light. If you want to look evil you could try this. The yellow on lips accentuates ur lips and makes them look wider specially with black slicks. You could even do a orange to a gradual yellow or a more saucy red to yellow.. All depending on how evil a personality you want to portray. A very offbeat look which people do not usually ever do.. Dare to try this one ? I love the palm trees! Yours are lovely and perfect as a canvas! 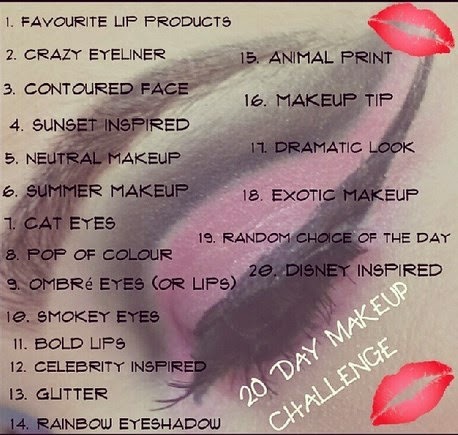 Oh the 20 days makeup challenge sounds so much fun! very striking - love that yellow! You're doing a grand job with the challenge!